Day/Night imagery produced from VIIRS data on Suomi/NPP easily shows the large extent of marine stratus off the west coast of southern California at 0900 UTC on 30 April 2013. That stratus may or may not be associated with low ceilings and reduced visibility that accompany IFR conditions. A fused product that incorporates surface-based data will show where IFR conditions are most likely, and that is shown above as well. Data from GOES-West and Rapid Refresh model output are combined to predict where IFR conditions are most likely. Plotted observations of ceilings and visibilities confirm that the highest probabilities neatly overlay observed IFR conditions. It is important to note that not all of the region covered by the marine stratus observed by the Day/Night band has IFR conditions. The careful viewer may have noted that the IFR Probability fields over the ocean are quite high in regions where the Day/Night band shows no clouds at 0900 UTC. GOES-R IFR Probabilities can be artificially enhanced in regions of Stray Light contamination in the GOES-West imager 3.7 data. This contamination occurs around 0900 UTC at this time of year. Note that by 1045 UTC (below), the stray light contamination has passed, and IFR probablilities over the ocean more properly align with the Day/Night band-observed cloud edges. A similar set of imagery from 1045 UTC shows a general reduction in the predicted area of IFR probabilities, although the region of highest IFR probabilities, along the coast, persists and as do IFR conditions. There was also fog over Monterey Bay on this morning. Click here to read about it. This entry was posted in California, Day/Night Band, Suomi/NPP on April 30, 2013 by Scott Lindstrom. GOES-R IFR Probabilities show a region over the Allegheny Mountains of northwest Pennsylvania slowly acquiring higher and higher probabilities, as ceilings and visibilities drop. How did this product perform relative to traditional fog detection imagery (the brightness temperature difference product) and relative to data from Polar Orbiting satellites? (The 0500 UTC imagery is excluded from the animation above because Stray Light Contamination in the 3.9 channel was apparent in the IFR probability fields). 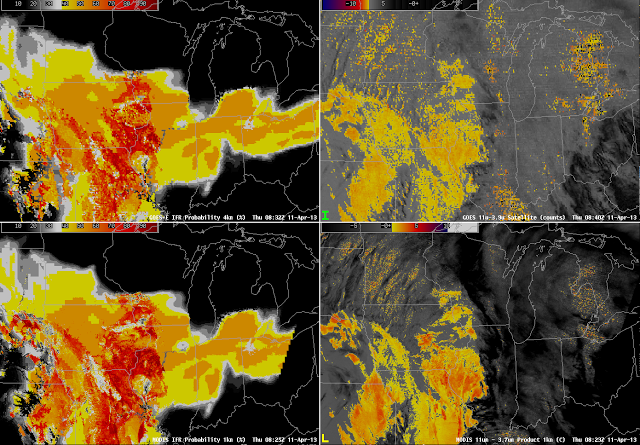 GOES-R IFR Probability computed from GOES-East, 0332 UTC (Upper Left), GOES-East Brightness temperature Difference field (10.7µm – 3.9µm) at 0340 UTC (Upper Right), GOES-R Cloud Thickness (Lower left), GOES-R IFR Probability computed from MODIS data, 0328 UTC (Lower Left). The ‘traditional’ method of fog detection that exploits emissivity difference of water clouds at 10.7µm and 3.9 µm, upper right in the figure above, at about 0330 UTC, just as the radiation fog was starting to develop, shows clouds detected over north-central Pennsylvania, but also from Centre County southwestward to the Laurel Highlands and to West Virginia. GOES-based and MODIS-based IFR Probability fields have very low probabilities with these primarily mid-level clouds. By 0615 UTC, IFR probabilities continue to increase over north-central Pennsylvania, and they remain low over southern and central Pennsylvania where mid-level clouds are reported (4100-foot ceilings at Johnstown, for example). Another MODIS overpass at 0740 UTC better resolves the character of the developing fog and low stratus over north-central Pennsylvania. Very high IFR probabilities in the MODIS-based fields outline the river valleys of the Allegheny Plateau in north-Central Pennsylvania. 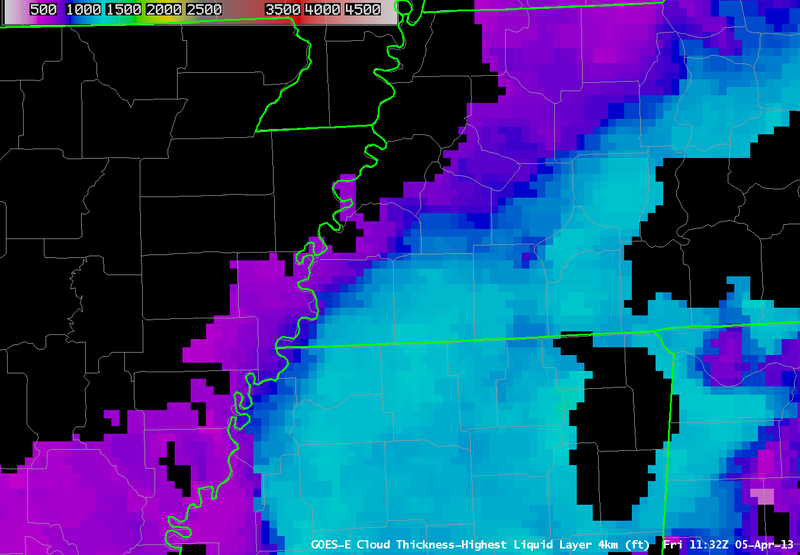 GOES-based IFR Probabilities are high, but GOES lacks the resolution to view clearly the individual river valleys. As above, but with Suomi/NPP brightness temperature difference (10.8 µm- 3.74µm) and Day-Night Visible imagery in the bottom right (0652 UTC), with the GOES-R IFR Probabilities (Upper Left), GOES-E Brightness Temperature Difference field (Upper Right), and GOES-R Cloud Thickness toggling between 0645 and 0702 UTC. 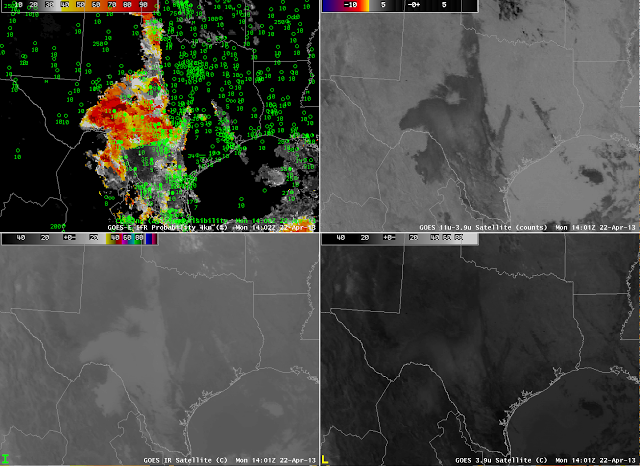 Suomi/NPP can also give information at high resolution about the evolving fog field. The tendrils of fog developing in the river valleys are evident in the visible imagery created using reflected lunar illumination (A mostly full moon was present the morning of 26 April) and those water-based clouds are also highlighted in the Suomi/NPP Brightness Temperature Difference Field. The clouds over the Laurel Highlands are higher clouds — they are casting shadows visible in the Day/Night band. The final GOES-R Cloud Thickness field before twilight conditions, above, shows maximum thicknesses of 900 feet over Warren County, Pennsylvania, and around 850 feet over southern Clarion County. According to this link, such a radiation fog will burn off in less than 3 hours after sunrise. The animation below of visible imagery at 1315 and 1402 UTC shows the fog, initially widespread in river valleys at 1315 UTC mostly gone by 1402 UTC. GOES-13 Visible Imagery, 1315 and 1402 UTC, 26 April 2013. Warren and Clarion Counties are highlighted. This entry was posted in Appalachia, Cloud Thickness, Day/Night Band, Mid-Atlantic, MODIS, Suomi/NPP, Terrain on April 26, 2013 by Scott Lindstrom. A coastal storm along the east coast was responsible for low-level moisture over eastern North Carolina that resulted in IFR conditions. Multiple cloud layers in the beginning of the animation above mean that IFR probabilities were computed using model data. By 0315 UTC, however, upper level clouds had moved off the coast, leaving behind clouds at low layers that meant cloud data (brightness temperature difference) could influence the IFR probability fields; consequently, the probability increased. High clouds remained offshore, however, and the character of the IFR probability field shows the characteristic pixelated appearance over land — where satellite data are used in the computation of IFR probabilities — and the characteristic smoothed appearance over water where only model data are used to produce IFR probabilities. Note how the highest IFR probabilities over eastern North Carolina do overlap the stations reporting IFR and near-IFR conditions. The image above compares GOES-R IFR probabilities computed with MODIS and with GOES-East. They do show very similar overall structures, with highest probabilities over land where the Brightness Temperature Difference field can contribute to the probability, and lower, smoother probability fields over water where only model data are used. Note that both GOES-R IFR fields correctly ignore the low cloud signal over eastern South Carolina and central North Carolina. 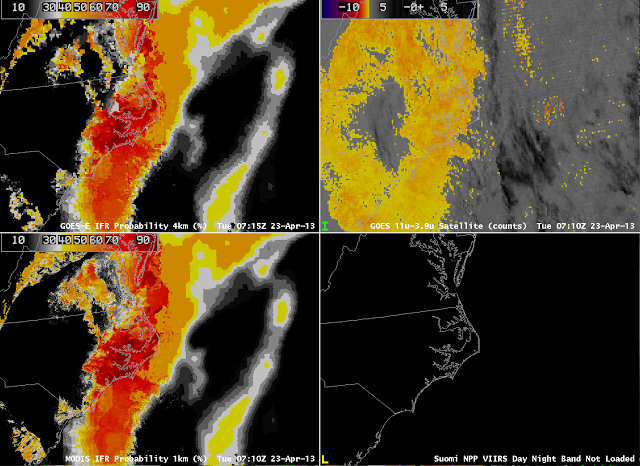 The GOES-based IFR probability field can also be compared to the Day/Night band sensed by VIIRS on board Suomi/NPP. The 0609 UTC Day/Night band shows the effects of a near-full moon on the product. The extensive cloud shield east of the Appalachians is visible, even though the image is at night, because of strong lunar illumination. As with the traditional brightness temperature difference field, however, the cloud information from the Day/Night band gives little information about the cloud bases; for that, the IFR probability field is needed, and low cloud bases are correctly restricted to extreme eastern North Carolina. The Day/Night band at 0747 UTC is from a time after the moon has set; only city lights and airglow are illuminating the clouds over Virginia and the Carolinas. Cloud edges are still easily discerned. This entry was posted in Day/Night Band, Mid-Atlantic, MODIS, Multiple Cloud Layers, Suomi/NPP on April 23, 2013 by Scott Lindstrom. Stratiform clouds developed overnight in return flow from the Gulf of Mexico. Some of the stratus was elevated, and some was closer to the surface creating IFR conditions. The GOES imagery above captures the area of low clouds that are also visible in the Day/Night band — but the MODIS IFR Probability field suggests a difference in the stratus field near San Antonio. Probabilities are far higher north of San Antonio’s latitude than south. Surface observations suggest that IFR conditions are more likely where the MODIS-based IFR probabilities are highest. (This demarcation line in the IFR Probability is far more noticeable in MODIS than in GOES). Note that the GOES Brightness Temperature Difference field has a positive signal that is near the north-south oriented lakes in eastern Texas and western Louisiana, and that signal is absent from the VIIRS Brightness Temperature Difference field. There is a misalignment between the 3.9 and 10.7 µm channels on GOES-13 (as discussed here) that has a maximum near 0900 UTC and that results in a false signal of low clouds. This co-registration error can propagate into the IFR Probability field in regions where the Rapid Refresh is suggesting near-saturation at lower levels. 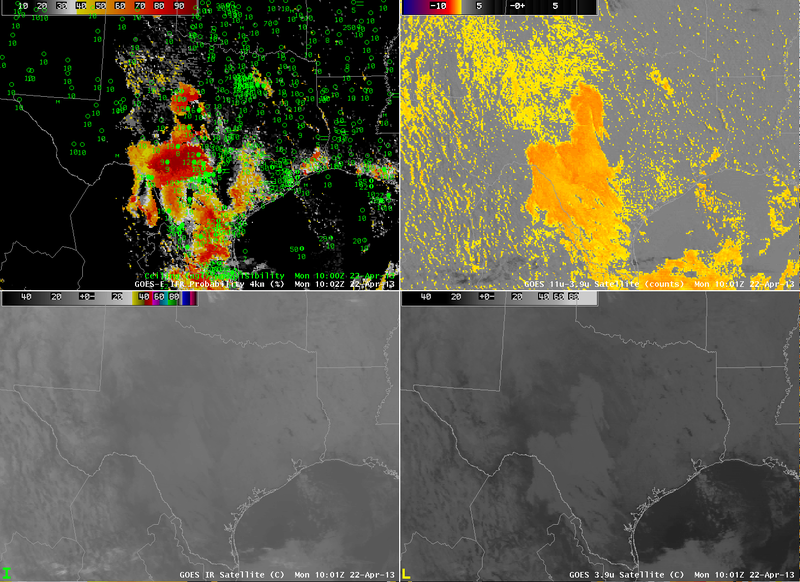 GOES-R IFR Probabilities (Upper Left) and surface observations of ceilings and visibility, GOES-East Brightness Temperature Difference (10.7 – 3.9) (Upper Right), Brightness Temperature at 10.7 (Lower Left) and 3.9 (Lower Right) at 1000 UTC (top image), 1215 UTC (middle image) and 1402 UTC (bottom image). The demarcation between regions with IFR conditions and MVFR/VFR conditions becomes more distinct in the GOES-based IFR probability fields at 1000, 1200 and 1400 UTC, as shown above. At all three times, the IFR probability field more accurately portrays the region of clouds that is most likely affecting aviation by displaying IFR conditions. This entry was posted in Day/Night Band, Suomi/NPP, Texas on April 22, 2013 by Scott Lindstrom. A significant shortcoming to the traditional method of detecting fog, the brightness temperature difference between 10.7 and 3.9 microns, which difference arises because of differences in the emissivity properties of water-based clouds at the two wavelengths, is that stratus decks and fog banks look very similar when viewed from a satellite. In this example from early morning on April 19th, low-level moisture trapped near the surface behind a significant rain-producing cyclone has allowed the formation of clouds over Missouri. But the brightness temperature difference field cannot say if these clouds are an aviation hazard. The surface observations of ceilings and visibilities show that ceilings are high and visibilities are unobstructed. The GOES-R IFR probability field correctly minimized the influence of the satellite signal in this region, because the Rapid Refresh Model does not predict conditions consistent with fog and low stratus. There are reduced visibilities and lowered ceilings near the cold front that at 1000 UTC was pushing into western Ohio, and these are correctly suggested by the IFR probability fields. Multiple cloud layers there preclude the detection of low-level clouds by the traditional brightness temperature difference method. In this case, the IFR Probabilities did a good job of eliminating the false positive from the brightness temperature difference over Missouri — where IFR conditions were absent — and of rectifying the false negative from the brightness temperature difference over Ohio — where IFR and near-IFR conditions were found. This entry was posted in Midwest, Multiple Cloud Layers on April 19, 2013 by Scott Lindstrom. Chicago O’Hare is a busy hub airport, and obstructions to visibility there have a great impact on air routing. Thus, any tool that can give information about ceilings and visibilities — IFR conditions — can help. In this animation from late afternoon on April 18, 2013, IFR Probabilities show a distinct minimum over northeast Illinois, and surface observations from airports in that region are consistent with the lack of low ceilings. In contrast, higher IFR probabilities exist over Wisconsin, where IFR conditions are widespread. IFR probabilities are high over Lake Michigan because high dewpoint air is moving over still-cold lake waters; advection fog results. This entry was posted in Midwest, Multiple Cloud Layers on April 18, 2013 by Scott Lindstrom. The multiple cloud layers that are common with an extratropical cyclone preclude identification of fog/low clouds by traditional brightness temperature difference methods because low clouds are overlain by mid-level and higher clouds. Thus, the satellite is unable to view them. In the images above from early morning on 11 April over the midwest, both GOES and MODIS detect low clouds over southern Iowa and Missouri. The GOES-R IFR Probability fields show enhanced probabilities over a larger region that stretches from northern Ohio westward to southwestern Minnesota, and southward from Iowa to Missouri. Observed ceilings show IFR (or near-IFR) conditions from northwest Ohio westward to northern Iowa. Regions of model-based enhanced IFR probabilities capture this region of IFR conditions. IFR ceilings also exist under the region where the traditional brightness temperature difference field has a strong signal. When interpreting the IFR probability fields, it is important to recognize the differences that arise due to differences in the predictors used (for example, between the higher IFR probabilities over southeast Iowa — where satellite and model data are used — and the lower probabilities over north central Iowa where only model data are used). This entry was posted in Midwest, MODIS, Multiple Cloud Layers on April 11, 2013 by Scott Lindstrom. Late-in-the-day rains followed by clearing skies and light winds set the stage for radiation fog over much of western Tennessee early on April 5th. The GOES-R Cloud Thickness product allows forecasters to estimate when radiation fog will burn off. GOES-R IFR Probabilities computed with GOES-East data (Upper left), GOES-East traditional brightness temperature difference (Upper right), GOES-R Cloud Thickness Product (Lower Left), GOES-R IFR Probabilities computed with MODIS data (Lower right), hourly from 0415 UTC through 1115 UTC on April 5th 2013. The animation above shows the retreat of rain clouds to the south and east, and the development of radiation fog. The IFR Probabilities around 0815 UTC — both GOES and MODIS — suggest a separation between the low stratus that is over Mississippi and Alabama and the fog over western Tennessee (the stratus shifts eastward and the radiation fog quickly develops). Fog/Cloud Thickness is greatest, a bit more than 1100 feet, in Fayette County just east of Memphis and in Henderson and Chester Counties a bit farther to the east and north. Scatterplot points on the chart suggest that the fog could burn off in 3 or so hours after the 1132 UTC image above. The visible loop animation, below, shows fog has cleared by 1432. This entry was posted in Cloud Thickness, Deep South, Dissipation Time, MODIS on April 5, 2013 by Scott Lindstrom. Two different systems — one approaching California, and one in the Gulf of Mexico — provide examples of how the GOES-R Fog/Low Stratus algorithm give information about visibilities and ceilings in regions where high clouds obscure the satellite view of low levels. The first case, off the West Coast, starts with a deck of high clouds over the coast associated with a landfalling cyclone. IFR Probabilities over the Pacific near the California coast are initially derived solely from Rapid Refresh model data. Consequently, IFR probabilities are not high. As the cirrus shield pushes inland, low clouds become visible to the satellite, and when both satellite and model predictors are used to compute IFR Probabilities, higher probabilities are a result. In addition, small-scale variability that is inherent in a satellite image (and perhaps not so inherent in model output) changes the character of the IFR Probability field from a flat field at the start to a more pixelated field later in the animation. As the low clouds push onshore, associated moisture and precipitation helps to generate near-IFR and IFR conditions in regions where the IFR Probabilities are depicted to be high. The second case, below, over the deep South, shows a region of fog/low clouds moving over Georgia as mostly model-based IFR Probabilities also move over the state. Strong convection over the Gulf of Mexico produced abundant high-level cloudiness; thus, IFR Probabilities could only be computed using Rapid Refresh Data over Georgia — but the computed IFR Probabilities both outline the region of lowest ceilings/visibilities and match their slow spread to the north and east into South Carolina. The IFR Probability field over Mississippi has a more pixelated look to it, and shows higher values, because satellite data are also used to diagnose the IFR Probability: IFR Probabilities are highest only where both predictors (model and satellite) are used. This entry was posted in California, Deep South, Multiple Cloud Layers on April 4, 2013 by Scott Lindstrom. GOES-R IFR Probabilities computed from GOES-East (Upper Left), MODIS Visible imagery and surface plots of ceilings/visibility (Upper Right), GOES-R IFR Probabilities computed from MODIS (Lower Left), MODIS 10.7 micron data (Lower Right), images at ~1630 and ~1815 UTC. Seventeen separate crashes involving nearly 100 vehicles near milepost 5 on Interstate 77 in Carroll County in southern Virginia claimed three lives on Sunday March 31st. The crashes occurred in fog and started around 1 PM (1700 UTC). How did the Fog/Low Stratus product do in alerting forecasters to the presence of the fog? This case demonstrates the challenges inherent in Fog Detection. GOES-R IFR Probabilities show a distinct reduction in probabilities over the crash site in the times bracketing the crash time, above. An animation of GOES-based IFR probabilities, below, shows relatively high probabilities until just before the crash time, after which time probabilities dropped. Photographs from after the crash, during the clean-up, show that fog persisted into the afternoon hours. Note that widespread fog is typically not associated with crashes. Rather, patchy fog that can be driven into from regions with greater visibility is a greater hazard. Such patchy fog is most likely to be sub-pixel scale. This entry was posted in Appalachia, Mid-Atlantic, MODIS on April 2, 2013 by Scott Lindstrom.